Join us and meet our experts at SUR/FIN to discuss the latest market requirements and to get more information about our state-of-the-art technologies. This year our SUR/FIN booth features four distinct industry areas each highlighting our products and competence in a specific sector: automotive, motorsports, heavy equipment and oil & gas. There are a selection of sector related parts which have been finished with Atotech’s electroless nickel and BluCr® technologies. Regarding our zinc & zinc alloy plating and zinc flake product lines, we are showcasing processes that increase production efficiency and are of interest for many applicators and OEM’s worldwide. Zinni® 220: an acid zinc nickel that provides comparable thickness distribution to alkaline zinc nickel but reduces the plating time by 33%. Zintek® ONE HP: a one-coat zinc flake coating that has 50% less steps than conventional zinc flake finishes. Our experts will also speak on a broad range of topics at the following sessions. We’ll be happy to see you there! 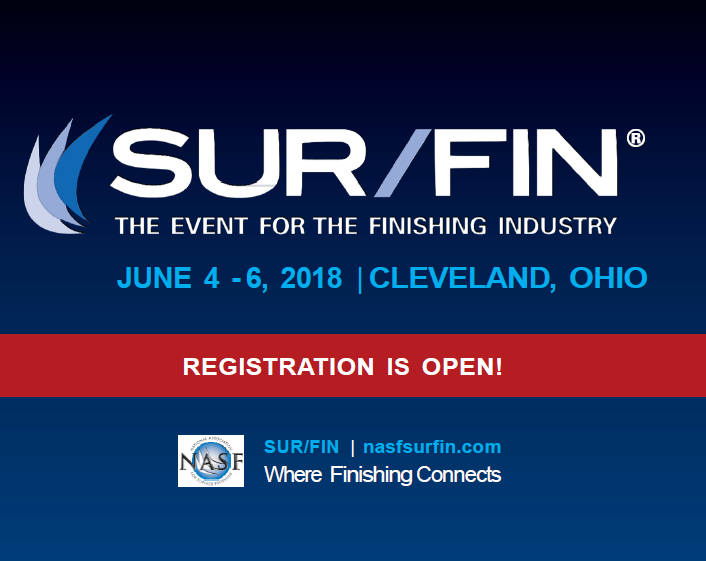 SUR/FIN is one of the major events within the finishing industry and a platform for leading surface technology companies, business leaders and experts. It is the primary conference and trade show dedicated specifically to the surface technology industry.